Buckeye Valley’s Chloe Dawson competes in a cross country meet last season. 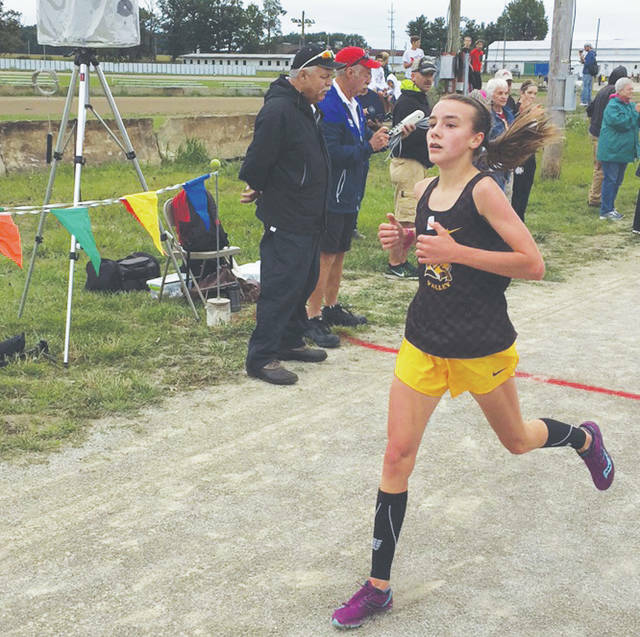 It’s easy for Buckeye Valley sophomore cross country runner Chloe Dawson to look back at last season and wonder about what might have been. An injury derailed a season in which she won six straight regular-season meets and broke the school record twice before things ground to a halt right before the MOAC race. And would-a, could-a’s aside, Dawson is champing at the bit to get back out there this year. So much so that BV coach Nate Ritz is trying to reel her in to avoid another injury. Dawson’s response? How about some cross training? Both Ritz and Dawson didn’t see this kind of success coming this quickly. Dawson might have won all seven meets had Ritz not held the team back in the opener at Northmor. Dawson broke Jenny Brooks’ record of 19:15.4 (set in 2001) twice and had five races in which she bested that time. She broke the record first at the Tiffin Cross Country Invitational with a time of 18:21.7 Sep. 9 before breaking it again two races later clocking in at 17:26.06 at the Midwest Meet of Champions Sep. 30. But her storybook season didn’t come without adversity. She felt some pain in her foot after the Barons’ regular-season finale at Marion Harding. She went to the doctor, who found a stress fracture and told her the season was over. Her parents took her to a specialist, who gave her the go-ahead to run after some rest. She was forced to keep the weight off her foot with a walking boot. Unfortunately, this meant she would miss out on some accolades. She missed out on the MOAC race and all-conference honors as a result. She was still wearing a boot and was unable to train in the days leading up to the district and regional races and took it off long enough to compete. She ran in those races, but wasn’t nearly at full strength. So, she missed out on all-district and all-regional honors as well. Thankfully, her teammates helped out her out. Fellow freshmen Ashley Beatty, Bailey Kreft, Chayse Arnhold and Jia Radloff helped BV to a third-place finish at the district race. Beatty, Kreft, Arnhold and senior Susie York helped Dawson give the Barons a fifth-place finish at the regional race to advance. “I’m really thankful that I had my teammates because without them I wouldn’t have been able to run at states,” Dawson said. Ritz took the reins off as well. “I told her to push it because there’s nothing left to hold back for,” he said. Her time of 18:39.5 was good for sixth place and a spot on the podium. It was also the fastest time for a freshman. “It was a great way to finish off a rough post-season,” Ritz said. It’s probable that Dawson would have at least received honors and would have been in contention to win all three races. The MOAC winner finished with a time of 19:40.1, the district-winning time was 19:04.96 and the regional-winning time was 18:42.62. Still, wondering what might have been serves as motivation for the upcoming season, which begins with BV’s Baron Blast Aug. 25.